Of the six movies I saw recently while flying to Bucharest and back, this was the best. Watching movies on an airplane is probably one of the worst ways to take in a movie, but here is one that I found myself enraptured by. 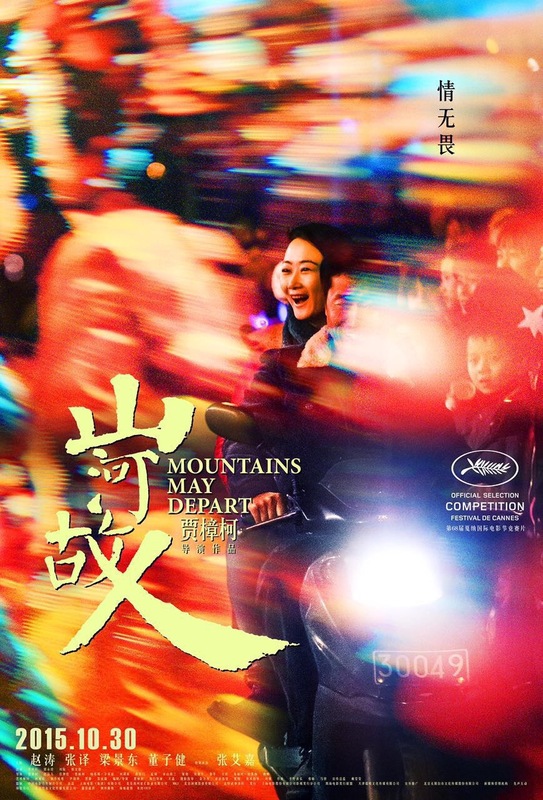 Chinese writer/director Jia Zhangke’s eighth feature film, “Mountains May Depart” – his first since the award-winning “A Touch of Sin” – is a touching and ambitious look at family and identity, and the loss and alienation that comes with it. It’s a complex film in how it has a story that moves through time and in how it defies any definitive genre labeling, but it exudes a relevancy that is never in doubt. “Mountains May Depart” may be a fictional story, but it feels like it certainly could be someone’s autobiography, because it feels so true to life. Jia’s story takes place in three different years and environments – 1999 and 2014 in China and 2025 in Australia. This approach serves to offer a look at how life changes for the main character and also to remind the viewer how time inevitably hits us with unwanted turns and subjugates us to situations that are less than ideal. We first meet Shen Tao (Zhao Tao, Jia’s wife and longtime star) in 1999, during a millennium celebratory dance sequence set to a Pet Shop Boys cover of The Village People’s “Go West”. It’s an energetic and vivacious look at both a young woman and a nation ready to embrace freedom. None of the characters travel in that geographical direction however, instead they stay in Northern China, in the coal-mining province of Fenyang (Zia’s birthplace and where many of his movies are set). This is where Tao is being courted by two men – one is the humble Liang (Liang Jingdong, another frequent collaborator with Jia), who manages equipment at the local coal mine and the other is gas station owner, Jingsheng (Zhang Yi), the more egotistical and emotional of the two, one who will eventually purchase the local coal mine where Liang works (only to fire Liang later on). Tao chooses Jingsheng, due to his financial security we assume, since it’s clear to the audience he’s not the best option for her. Nevertheless, the two hook up, get married and seem to fall into typical newlywed mode – only, it’s clear their hearts aren’t into it and no matter of faking it will help them make it – even if they’ve bought a puppy together. The story then takes us to 2014, where we learn that the couple has divorced. It’s not surprising, but it’s also no less saddening. Tao has stayed in Fenyang and now runs both the gas station and the coal mine, becoming quite a wealthy businesswoman, while Jingsheng lives in Shanghai with a new wife and his 7 year-old son with Tao, which he named Dollar. It’s a heartbreaking situation, since we can tell that the boy would be better off with his mother, but his domineering father – who is making sure his son learns English in anticipation of a move to Melbourne, Australia – has delusions of what’s best for Dollar. During this time, we also learn (as does Tao) what has happened to Liang during his absence from Fenyang. He returns as a husband and father and with a lung disease that has developed from years working in the coal mine. Tao learns of this when Liang’s wife asks for the money needed for his medical care. Maybe she feels somewhat responsible for her friend’s condition, since she owns the coal mine. At the same time, Tao’s father’s health has faded, leaving a devastated daughter who is torn by guilt and loneliness. She requests that Dollar visit her for her father’s funeral, to pay respect to a grandfather the boy never knew. Since he hardly knows her, it doesn’t necessarily go as planned and really only serves to remind Tao how lonely she is – with her son developing a life without her and getting along just fine under his father’s roof and another woman to play mother. When the story shifts to the year 2025, the future is subtlety apparent in handheld technology Dollar (Zijian Dong, one of four roles he played in 2015) uses, yet differs from the rest of the film in that it focuses on the boy whose become a young college student. He is resentful toward both his parents – with his distant father, now divorced and feeling ostracized in Melbourne by his homeland and having lost all contact with his mother back in China. He jokingly refers to himself in front of his class as “a test-tube baby” for which his teacher replies, “even test tube babies have a mother”. Dollar’s heartache is obvious and it seems he’s feeling the same loneliness and isolation his parents are feeling. He has no interest or aim in college and is trying to tell his stubborn father that he’s dropping out, but the delusional Jingsheng isn’t having it. Dollar develops stronger feelings of separation from his heritage, as he works in a Chinese restaurant where the language seems foreign to him and while attending a Chinese culture class for other expats his age. Dollar draws close to the Hong Kong-bred teacher, Mia (Sylvia Chang, from Ang Lee’s “Eat Drink Man Woman”), and the two become friends and eventually friends with benefits, despite Mia being close to his mother in age. Sure, it feels like he’s gravitating to her due to his loss of and need for a mother in his life, but it also feels quite natural and understandable. That last storyline suffers slightly from a lack of Zhao Tao’s powerful performance as Tao and it may even be a bit lengthy, but when Dollar does reunite with his mother at the tail end of the film, Jia provides an overwhelming and tearful ending that is earned. 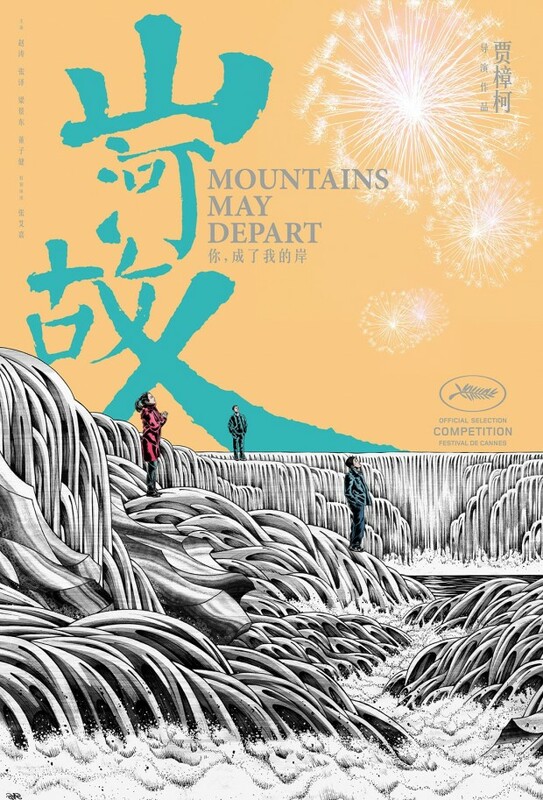 I’m still getting into Jia’s work as a writer/director and “Mountains May Depart” confirms that I’m in for a treat when I continue looking into his earlier work. Not only is he a fascinating screenwriter, he’s also astute to the emotional impacts and responses to feelings such as: guilt, regret, loneliness and isolation – especially as they pertain to parent/child relationships. As for his directing, some of his shots are frame-worthy, especially early on as we witness the three main characters getting to know each other. 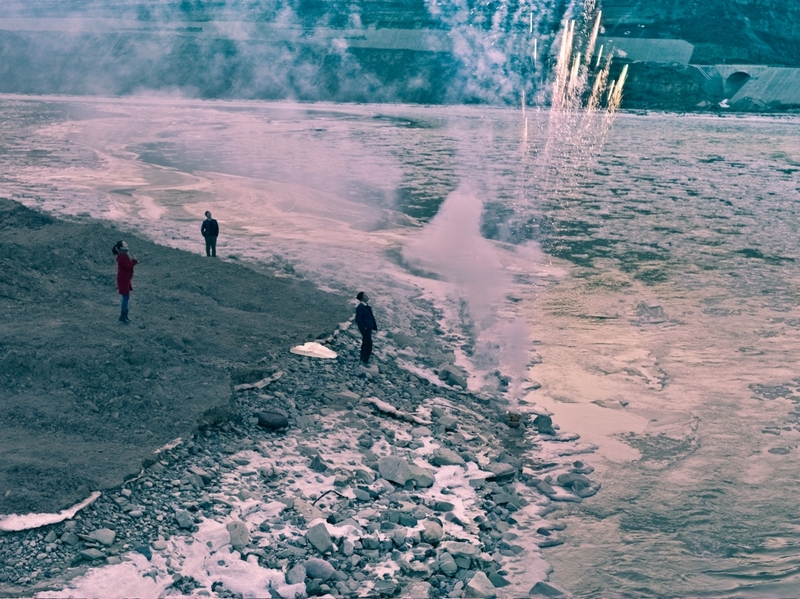 Some of Jia’s shots are quite artful, dreamlike even, especially when we see Tao and her two suitors observe breaking ice floes adrift in the local river in 1999 – almost as if Jia wants us to remember our own memories that randomly float to the surface as time goes on. The look of the film also changes as the story unfolds, with Jia and his frequent cinematographer, Nelson Yu Lik-wai (“A Touch of Sin” and “Still Life”) incorporating footage they had taken back in 1999 and 2014, presented in an almost square format on the screen (again, as if we’re flipping through someone’s memories) and then later on, there’s a more horizontal look and then a later format that is full widescreen. It’s all in a conscious effort to offer the variety that life offers. Heavy and light emotions match the filmmaker’s mise-en-scene in “Mountains May Depart”, reminding viewers how life’s joys and heartaches cannot be avoided, but we can connect and reconnect as many times as it takes to find fulfillment. ← Keeping It Reel Goes to Bucharest! Agree with this review wholeheartedly. The third section wasn’t as strong as the previous two but it all comes together in the final shot, which feels like a negative mirror image of the opening shot. An incredible statement about the sadness of the Chinese diaspora and the dissolution of families. Zhao Tao rules.